Vitamin B12 Foods for Vegetarian, Indian Cobalamin Rich Foods list. 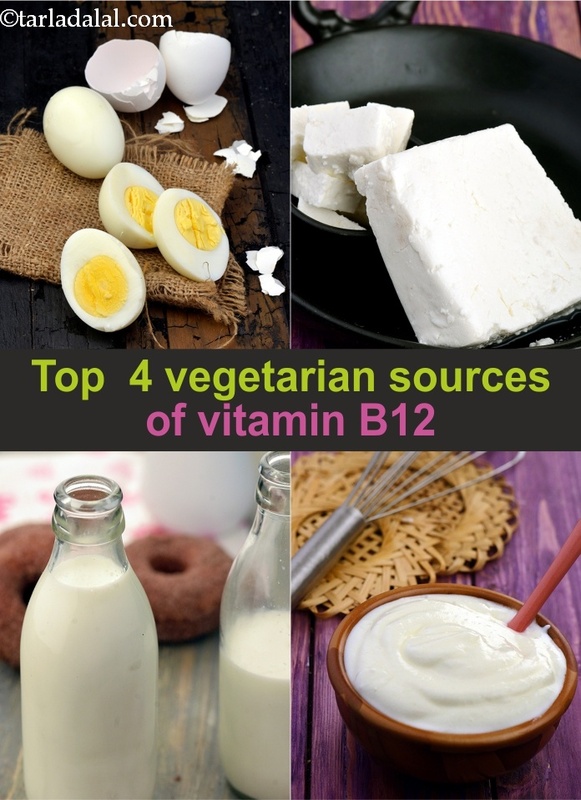 The main sources of Vitamin B12 for vegetarians is eggs, milk, curds and paneer. So have more raita, include more punjabi paneer recipes, have some chaas, low fat chaas. Vitamin B 12, also known as cobalamin, is one of the last members of B-complex vitamins discovered in 1948. It is red in colour and mainly contains cobalt. Besides cobalt, it contains carbon, oxygen, phosphorus and nitrogen. Eggs are the best source of Vitamin B12 for vegetarians. You can try an egg roll recipe as a snack. For paratha lovers there is egg paratha recipe or egg bhurji paratha. There is egg dosa , hard boiled eggs, fried egg recipe , sunny side up eggs and deviled eggs for breakfast . With your meals you can have egg curry and egg biryani recipe. 1. The production of red blood cells (RBC) which carry oxygen and nutrients to all parts of our body. 2. Overall growth and development of the body. 3. The normal functioning of all the cells, especially those of the bone marrow, nervous system and GI tract. A low level of Vitamin B12 have characterized symptoms like lethargy loss of appetite, headache, sore tongue, weight loss, nervous system abnormalities and tingling of extremities. Serve deficiency leads to Megaloblastic anaemia. A little effort in trying a few of our vegetarian recipes rich in Cobalamin will help pure vegetarians make up for their vitamin B12 requirement partly.